Retail workers have engaged in more shift work and longer hours in recent years, which can lead to fatigue and related health issues. Through its Total Worker Health® Program, the National Institute for Occupational Safety and Health (NIOSH) recommends an integrated approach to addressing fatigue in retail work. NISOH says this type of approach helps protect workers from work-related injury and illness and helps them advance their overall health and well-being. NIOSH’s publication describes organizational practices related to scheduling, flexibility, and the work environment that can help address the causes and consequences of fatigue among retail workers. 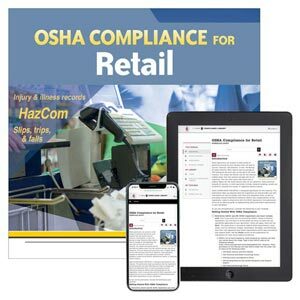 J. J. Keller's OSHA Compliance for Retail Manual is designed specifically for the retail industry to aid in OSHA compliance.